I spotted my first orangutan high up in the trees in the early morning. I heard it before I saw it. I awoke to branches cracking and some pretty furious tree-shaking going on. Lucky for me I was on a boat, at a safe distance from the huge, hairy, red orangutan who was working himself up into a right state. I was in total awe of this large primate of the jungle. He was swaying in the very top canopy which towered 30 metres into the sky. Nanang’s words rung true as we soon spotted three more orangutans; the king’s much smaller females. They were wonderfully camouflaged and difficult to spot, wrapping their branch-like limbs around the trees and blending perfectly into their environment. 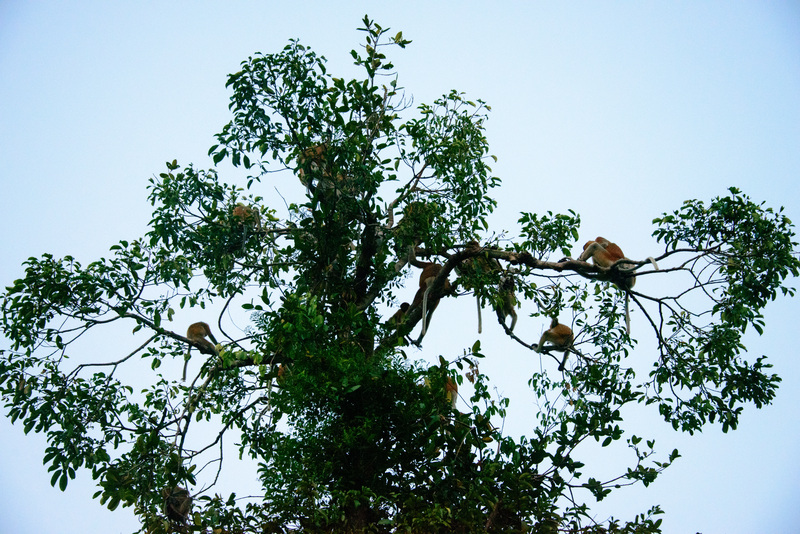 Within minutes of sighting the orangutans, a family of proboscis monkeys joined in this early morning spectacle. There were seven of them and they swung with wild abandon through the trees, grabbing vines and thin branches on their way. They disappeared quickly into the dense jungle, and I was left holding my morning coffee, which had gone cold, marvelling at what I had just witnessed. To experience Tanjung Puting National Park, you need to take a boat. You fly into Pangkalan Bun, Central Kalimantan, and from there you meet your guide and take a short car ride to meet your boatman. You need a minimum of three days. The park, which was established in 1982, remains a truly wild and natural place. Your ultimate destination is Camp Leakey, an orangutan rehabilitation centre set up in 1971; the oldest Orangutan Research and Conservation Centre in the world. The camp looks after misplaced orangutans that have been forced out of their natural habitat due to deforestation, forest burning and the encroachment of agriculture, including palm oil plantation expansion. Many of the orangutans at the camp are bottle fed, and some who arrive as orphans are in a very distressed state. The younger ones require physical handling and touch, just like a human baby, and the orangutan handlers rock these small infants sometimes for hours. Eventually, they are nurtured back to health and taught to fend for themselves in the wild and search for food, but before this can happen, they must learn the skills required for surviving in the jungle. In this transition stage, they have a bit of help, and three feeding platforms are positioned in the jungle. I was only ten minutes into my trek when I heard a crashing through the trees and found myself sharing the forest trail with three orangutans. It was very exciting and a little nerve-wracking at the same time. The park ranger who was accompanying our group assured us we were very safe. One came swinging through the trees and another two lumbered up behind us walking on all fours using their palms and fists. Picking up speed as they trudged past, they made a beeline for the platform, which was piled with bananas. Soon more orangutans gathered for a feed. They ate, tossed banana skins, scratched their armpits, looked around and socialized. When we were back on the boat cruising up the river looking for a place to dock for the night, we were lucky to catch a glimpse of a few gibbons, which ended the day very nicely. As the sun was going down, a magnificent lone hornbill cruised gracefully by on a steamy jungle air stream. 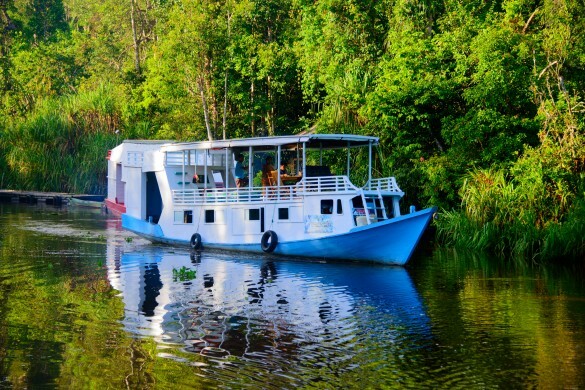 Discovering the Tanjung Puting National Park on a slow boat is a peaceful way to connect with nature, birdlife and wildlife. Having the opportunity to get up close and personal with an orangutan, which shares 97 percent of our DNA, will leave you with a very humbling feeling that we are somehow close in many ways to these great primates. Orangutans are endemic to Sumatra and Borneo. These large apes are found to be highly intelligent and follow a cultural pattern. The Borneo species are larger and more solitary compared to their Sumatran cousins. They have rounder faces and male adults develop wide cheek flanges as they grow older. In the wild, they live to around 45 years, but in captivity, they can age up to 60 years. Males can grow to 100kg and 1.4 metres tall while females can weigh up to 50kg, to a height of 1.2 metres. Borneo orangutans feed on fruits, including figs, durians and bananas, leaves, bird eggs, honey and insects. 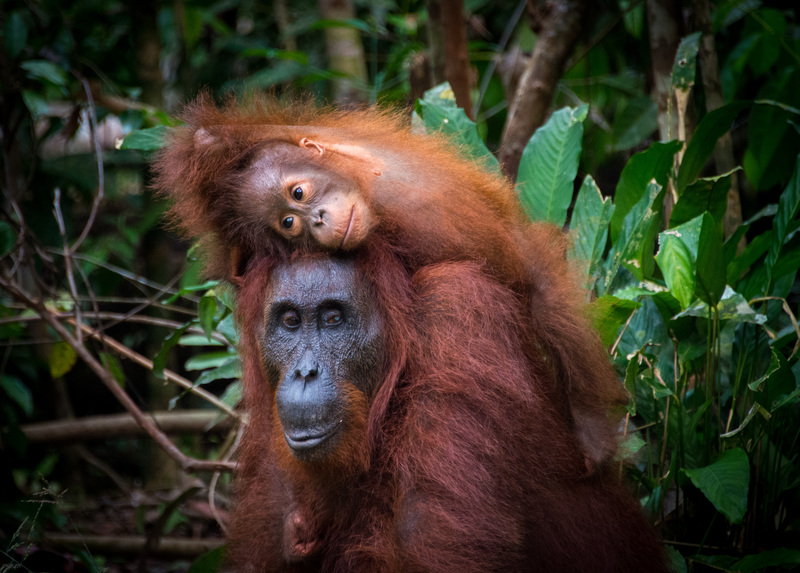 Borneo has the largest population of orangutans, yet today their species is threatened due to a rapidly shrinking habitat caused by forest fires and expanding human settlement, palm oil plantations, mining, as well as being hunted to be sold as pets. David Metcalf runs cultural tours to Kalimantan. David is leading a tour on May 18-23, 2016 to a cultural Dayak Festival, The Isen Mulang Festival, featuring 17 Dayak tribes. This trip includes a visit to see the orangutans and attend a 3-day Tiwah (traditional Dayak funeral ceremony).